The BIG3 returned to Brooklyn, site of its first-ever games in 2017, this time to crown the league’s 2018 champion. When the smoke cleared, top-seeded Power displayed the dominance it showed all season, disposing of 3’s Company, 51-43, to earn the Julius Erving Championship Trophy before a crowd of 13,504 at Barclays Center. Power coach Nancy Lieberman, already making history as the first female to coach a men’s professional sports team, capped off her rookie season in the BIG3 with a title. Power captain Corey Maggette, who went down with a torn Achilles in Brooklyn last year, came back to earn MVP of the regular season – and then he capped it off by being MVP of the championship game with a game-high 27. Amazingly, 3’s Company opened the scoring with a Drew Gooden 3-pointer and Andre Emmett jumper to take a 5-0 lead. 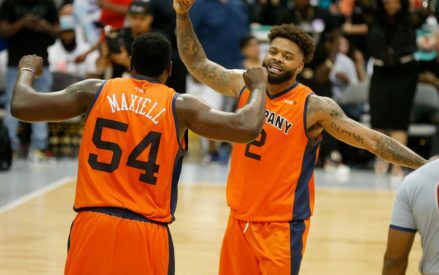 After a layup from Glen “Big Baby” Davis and a 3-pointer from league MVP Corey Maggette, the game was tied at 5. The game was tied again at 7 when Maggette made a jumper to make it 9-7. That’s when the game was briefly interrupted by what nearly became fisticuffs. Dahntay Jones made contact with Maggette on the shot release and Maggette let him hear about it after the basket. The two got heated, and benches cleared. After refs took control and got the players settled down, Power completely took over. They closed the half on a 12-0 run, going to halftime with a 25-13 lead. Maggette led all scorers with 16. Power continued to roll as the second half began, building the lead to as much as 20. With a commanding 35-15 lead, Lieberman was asked during a break what her team had to do to close it out. The lead was still 15 when Power made it to the brink with a 49-34 lead. But a brief Power outage made things a little interesting. Led by Emmett, as they have been most of the season, 3’s Company scored nine straight points to close within six at 49-43. That’s when Cuttino Mobley took matters into his own hands with a mid-range jumper to clinch the win and the championship. Mobley finished with 27 points and 6 rebounds. Davis had 10 points; Mobley had 9. Emmett led 3’s Company with 24. If the consolation game was actually for the championship, this game might have gone down as one of the greatest title games in any sport. Despite missing co-captain and BIG3 rebounding and double-double king Reggie Evans, the 3-Headed Monsters used a 10-2 run to take an 18-10 lead. But that’s when Tri-State’s Amar’e Stoudemire took over the half and the game was eventually tied at 24. Stoudemire was a force driving to the basket and at one point he had 16 of Tri-State’s first 20 points. “He might be auditioning right now,” Jim Jackson said on the FOX broadcast. Perhaps the NBA scouts were watching. The 3-Headed Monsters made the last basket of the half to take a 26-24 lead. Stoudemire led all scorers at that point with 16 (7-of-9), while Mahmoud Abdul-Rauf led the Monsters with 12. David Hawkins, who had been a force all season for Tri-State, scored the first four points of the second half to grab the lead, but the Monsters got it right back with consecutive 3-pointers from Qyntel Woods and Abdul-Rauf. The game was back-and-forth the rest of the way, with multiple lead changes, until a Hawkins jumper gave Tri-State point game at 47-44. That’s when Abdul-Rauf took over. He made a layup made it 47-46, then a 3-pointer gave the Monsters a 49-47 lead. Stoudemire made a layup to tie the game at 49. That’s when Abdul-Rauf sank his fourth 3-pointer of the game to clinch the victory. Abdul-Rauf led all scorers with 28. Woods had a double-double (20, 12). Stoudemire finished with 22 points; Hawkins had 17.